The Philippines' most active volcano continued to spew fountains of red-hot lava and massive ash plumes Tuesday in a dazzling but increasingly dangerous eruption that has sent 56,000 villagers to shelter in evacuation centers. Lava fountains gushed up 2,300 feet above Mount Mayon's crater and ash plumes rose up to 1.9 miles at night and before daybreak, according to the Philippine Institute of Volcanology and Seismology. An explosive eruption at noon Monday was the most powerful since the volcano started acting up more than a week ago. Authorities warned a violent eruption may occur in hours or days, characterized by more rumblings and pyroclastic flows - superheated gas and volcanic debris that race down the slopes at high speeds, vaporizing everything in their path. After Monday's huge explosion, officials raised Mayon's alert level to four on a scale of five, and the danger zone was expanded to 5 miles from the crater, requiring thousands more residents to be evacuated, including at least 12,000 who left their homes and then returned during gentler eruptions. Authorities struggled to prevent villagers from sneaking back to check on their homes and farms and to watch a cockfight in an arena in Albay's Santo Domingo town despite the risks and police patrols and checkpoints, said Cedric Daep, a provincial disaster-response official. "If pyroclastic flows hit people, there is no chance for life," Daep said. "Let us not violate the natural law, avoid the prohibited zone, because if you violate, the punishment is death penalty." 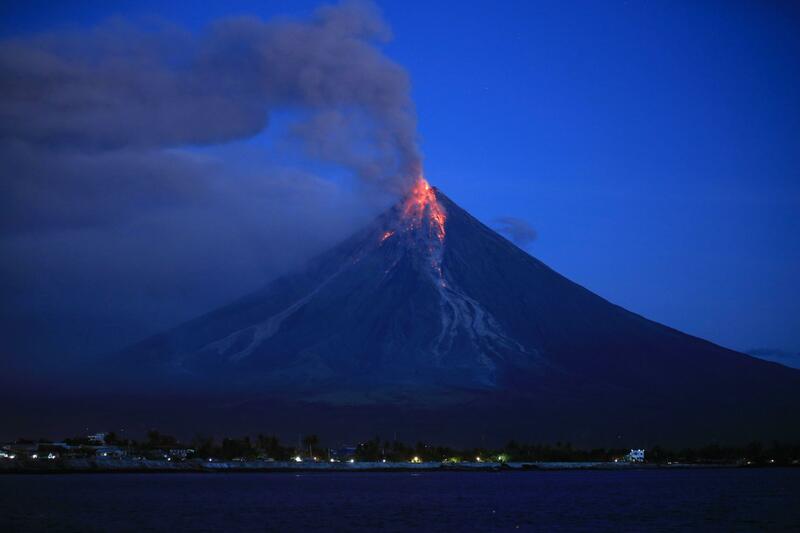 The daytime eruptions have plunged nearby villages in darkness and sent lava, rocks and debris cascading down Mayon's slopes toward the no-entry danger zone. There have been no reports of deaths and injuries. Airplanes have been ordered to stay away from the crater and ash-laden winds and several domestic flights have been canceled. With its near-perfect cone, Mayon has long been popular with climbers and tourists but has erupted about 50 times in the last 500 years, sometimes violently. The 8,070-foot volcano has generated tourism revenues and jobs in Albay, which lies about 210 miles southeast of Manila.